The IndyCar superhero is back and wants to win the championship this year. Helio Castroneves is back in the hunt for the championship that has seemingly eluded him throughout his IndyCar career. He's been a bridesmaid four times, but never the bride. His win today in the Iowa Corn 300 put him just eight points out of the championship lead. 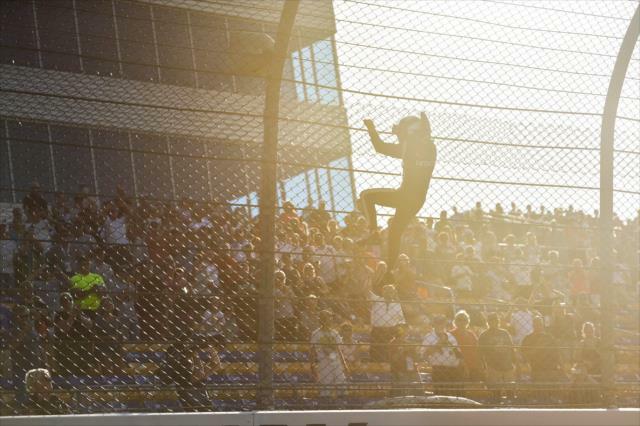 Following the win, Castroneves, at a spry 42-years old, did his trademark "Spider-Man" fence climb. The Penske driver's win today was a solid, if not dominant performance on the short oval. He ran up front for most of the race. When he did get shuffled back into the pack, he effortlessly made his way back to the lead. After the final round of pit stops Castroneves just took off, opening a gap that made it impossible for anyone to challenge him. The race was punctuated with a handful of safety cars for small incidents. Each safety car came right in a pit stop window, which kept most everyone on equal footing for most of the race. 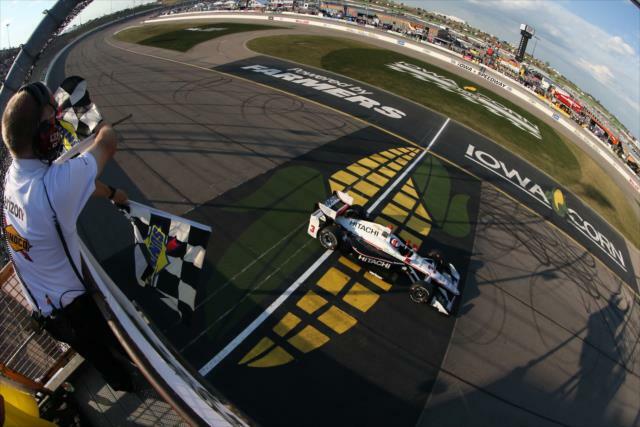 A pit stop under green-flag running at the Iowa Speedway will cost a driver two laps. With the majority of the field pitting at the same time under yellow, the race played out a little more normally that most at the track. A few drivers opted to pit off-cycle, but they were quickly shuffled back into the pack when everyone else stopped for fresh tires. The race was also briefly red-flagged for a light rain that blew in. Even the slightest bit of water on an oval track can be extremely dangerous. It's far better to stop the race for a few minutes than to expose the drivers to more risk than they already are in just by being behind the wheel in a race car. 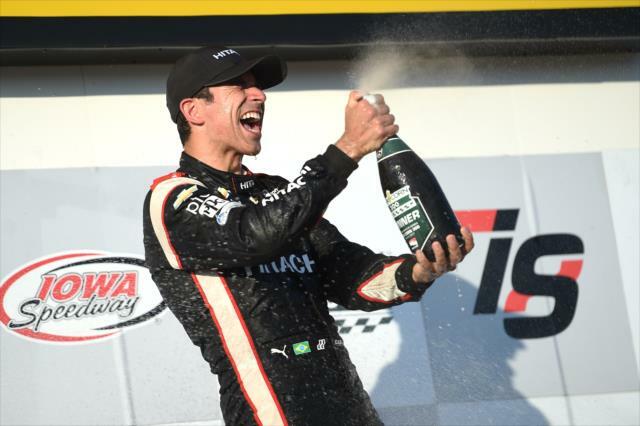 Sunday's win for Castroneves was his first in three years. With the exception of this year's Texas demolition derby, Castroneves has finished in the top ten in every race, which has netted him a decent haul of points each race. Consistency goes a lot further that a few wins and a bunch of mediocre finishes and DNFs. In what is probably Castroneves final year as a full season IndyCar driver, going out with a championship would be pretty special for him. Why would Castroneves be leaving IndyCar when he is still competitive and driving for a team like Penske? It seems that Roger Penske has a new job for him in 2018. The worst kept secret in American racing these days is that Penske will likely have a Honda-powered DPi in the IMSA WeatherTech SportsCar Championship next year. If anyone is going to give Cadillac and the Taylor brothers a run for their money, it'll be Penske. The Drive will hopefully have some more information on the Penske DPi program soon, so be on the lookout for it.